Elected President in November 2007 (thereby succeeding her husband Néstor Kirchner), Cristina Fernández de Kirchner has proved she is her own woman. 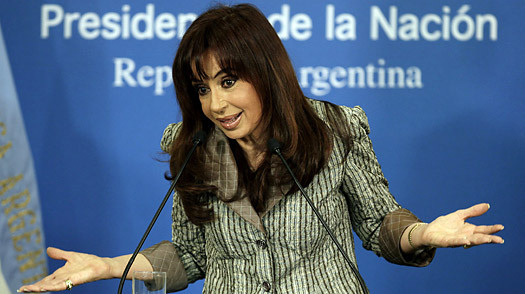 Dismissively referred to as Cristina by some members of Argentina's macho political elite, Fernández has survived a standoff with the country's powerful farming lobby, a fallout with the U.S. over a suitcase allegedly containing illegal campaign contributions and a series of high-profile economic-policy spats that culminated in the ousting of the governor of Argentina's Central Bank earlier this year. With her striking appearance and polarizing rhetoric, she inevitably draws comparisons to former First Lady Eva Perón. See the top 10 most colorful First Spouses.